Olaplex: the new salon wonder-treatment that ACTUALLY fixes damaged hair. The brainchild of scientists (NOT beauty insiders), which can transform brittle and broken hair. Described as ‘hair magic’ and ‘the hair holy grail’ – its patented formula is proven to repair even the most bleached and frazzled locks and restore them to their former glory. Olaplex, developed in the U.S. and launched to great acclaim there at the end of last year, has a massive celebrity fan base. With everyone from top hairdressers to the likes of Jennifer Lopez, Kim Kardashian and Gwyneth Paltrow hooked. 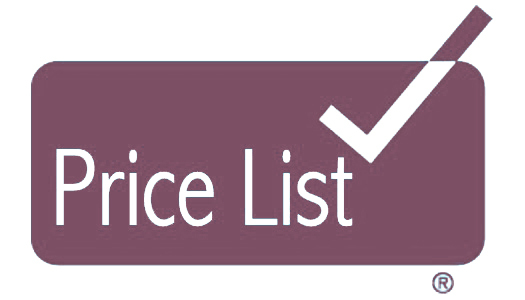 (Kim sleeps in Olaplex number 3, the at home treatment – and was recently on You Tube raving about it!). Olaplex is the new revolutionary hair treatment that revives and repairs dry and damaged hair. It can be used as a home treatment to keep hair healthy between salon visits or in salon when colouring hair. Kim Kardashian was the best example of extreme hair colour changing when she famously went from brown to platinum blonde with no straw like texture, broken ends or frizz in sight. It is a 3 step salon system that helps to permanently repair, rebuild and re-link broken bonds within your hair. These are the bonds that get damaged from hair dye, perming, heating tools etc. So if your hair is looking dry, brittle, frizzy and stretches like chewing gum when wet then this is the answer for you! These two treatments allow your hairdresser to rebuild the strength and structure of your hair so sit back, relax and wait to be astounded by your new head of luscious locks. 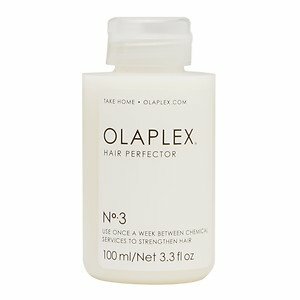 Olaplex No.3 repairs the hair from within the hair shaft and strengthens on the inside, after treatment you will need a good PROTEIN BASED shampoo and conditioner to see the silky, soft results on the outside. So if your hair is in need of some serious TLC or you just fancy a new and extreme change in hair colour then Olaplex is the answer! No.3 consists of the same active ingredients that are in No.1 and No.2 so you can maintain the condition of your hair when you leave the salon. PLEASE NOTE THAT OLAPLEX No.3 IS NOT A CONDITIONING TREATMENT! The three-step programme works by repairing bonds within the hair shaft, known as disulphide bonds. These are broken during the process of hair colouring and heating, resulting in hair that is weakened and damaged – you would notice dullness, frizz, dryness and breakage. 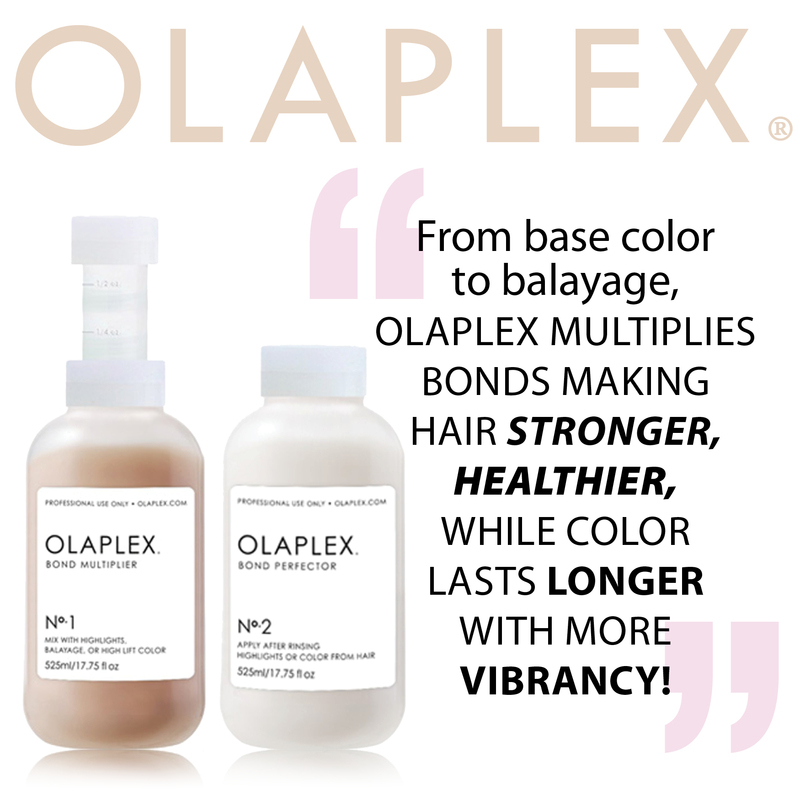 The clever science behind Olaplex gets inside the hair, permanently repairing these bonds and drastically improving the condition and texture of the hair. It’s like re-discovering your virgin hair, age 16, before sun, styling & colour took their toll. It’s suitable for all hair types, and can be added to the usual colour process to negate damage, or applied as a stand alone re-structuring treatment in salon, at the basin.